A perfect dawat recipe to impress your guests. Make Madrasi chicken the way we do and enjoy. 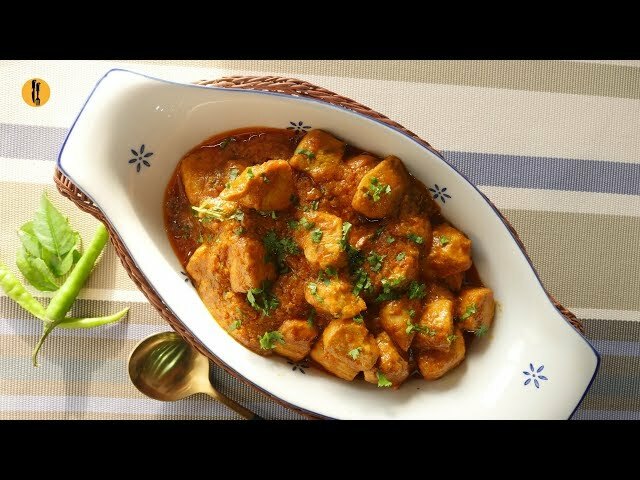 #HappyCookingToYou #SimplySufi #SufioilandGhee Written Recipe: http://bit.ly/2Q3gVVs Madrasi Chicken Serves 4-5 Recipe in English: Ingredients: -Simply sufi breast fillets ½ kg -Dhania powder (Coriander powder) 1 tsp -Lal mirch powder (Red chili powder) ½ tsp or to taste -Haldee powder (Turmeric powder) ½ tsp -Paprika powder 1 & ½ tsp -Zeera (Cumin seeds) roasted & crushed ½ tsp -Mustard powder 1 & ½ tsp -Namak (Salt) 1 tsp or to taste -Pani (Water) ½ Cup or as required -Imli ka pulp (Tamarind pulp) 2 tbs -Pyaz (Onion) 1 large -Hari mirch (Green chilies) 1-2 -Lehsan (Garlic) 5-6 cloves -Adrak (Ginger) 1 inch piece -Curry pata (Curry leaves) 8-10 -Tamatar (Tomatoes) blanched 4 medium -Sufi cooking oil ¼ Cup -Hara dhania (Fresh coriander) chopped 1-2 tbs -Hara dhania (Fresh coriander) chopped Directions: -Cut chicken fillets into cubes then wash & pat dry and set aside. -In bowl,add coriander powder,red chili powder,turmeric powder,paprika powder,cumin seeds,mustard powder,salt,water and mix well. -Add tamarind pulp,mix well & set aside. -In blender jar,add onion,green chili,garlic,ginger,curry leaves,blend well & set aside. -Remove skin of blanched tomatoes. -In grinder,add tomatoes and grind to make a puree & set aside. -In pot,add sufi cooking oil,blended onion mixture and cook for 5 minutes. -Add chicken boneless cubes,mix well until changes color and fry until light golden. -Add grinded tomato puree,mix well and cook for 6-8 minutes. -Now add prepared spices mixture,mix well and bring it to boil. -Add fresh coriander,cover and cook on low flame for 8-10 minutes. -Garnish with fresh coriander & serve! Recipe in Urdu: Ajza: -Simply sufi breast fillets ½ kg -Dhania powder (Coriander powder) 1 tsp -Lal mirch powder (Red chili powder) ½ tsp or to taste -Haldee powder (Turmeric powder) ½ tsp -Paprika powder 1 & ½ tsp -Zeera (Cumin seeds) roasted & crushed ½ tsp -Mustard powder 1 & ½ tsp -Namak (Salt) 1 tsp or to taste -Pani (Water) ½ Cup or as required -Imli ka pulp (Tamarind pulp) 2 tbs -Pyaz (Onion) 1 large -Hari mirch (Green chilies) 1-2 -Lehsan (Garlic) 5-6 cloves -Adrak (Ginger) 1 inch piece -Curry pata (Curry leaves) 8-10 -Tamatar (Tomatoes) blanched 4 medium -Sufi cooking oil ¼ Cup -Hara dhania (Fresh coriander) chopped 1-2 tbs -Hara dhania (Fresh coriander) chopped Directions: -Chicken fillets ko cubes mein cut ker lein phir dho ker pat dry karein & side per rakh dein. -Bowl mein dhania,lal mirch powder,haldee powder,paprika powder,zeera,mustard powder,namak aur pani dal ker ache tarhan mix ker lein. -Imli ka pulp shamil karein aur ache tarhan mix ker lein & side per rakh dein. -Blender jar mein pyaz,hari mirch,lehsan,adrak aur curry pata dal ker ache tarhan blend ker lein & side per rakh dein. -Blanched tamatar ki skin nikal lein. -Blender mein tamatar dal ker ache tarhan grind ker ka puree tayyar ker lein & side per rakh dein. -Pot mein sufi cooking oil,blended pyaz ka mixture dal dein aur 5 minutes kliya paka lein. -Chicken boneless cubes dal dein aur rang tabdeel hunay tak ache tarhan mix ker lein aur light golden hunay tak fry ker lein. -Grinded tamatar ki puree dal ker ache tarhan mix karein aur 6-8 minutes kliy paka lein. -Ab tayyar spices mixture dal ker ache tarhan mix karein aur ubal anay dein. -Hara dhania dal ker dhak dein aur halki ancch per 8-10 minutes kliya paka lein. -Hara dhania sa garnish ker ka serve karein!